I'm an affiliate for Notoriously Morbid. That means I make a commission if you use my code below. Find out more information here. What is Notoriously Morbid Vanishing Cabinet? 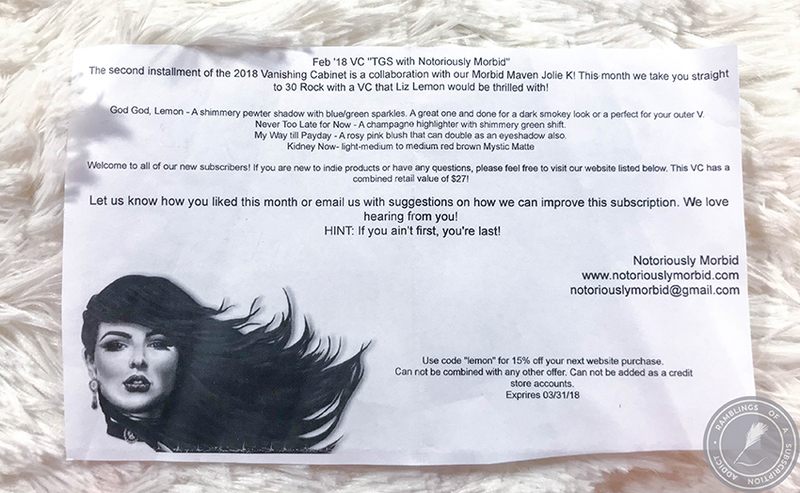 : Vanishing Cabinet is a monthly subscription box by Notoriously Morbid where each month you get a bag of indie makeup. Bags include four to five themed items (a combination of minis and possibly full-sizes). 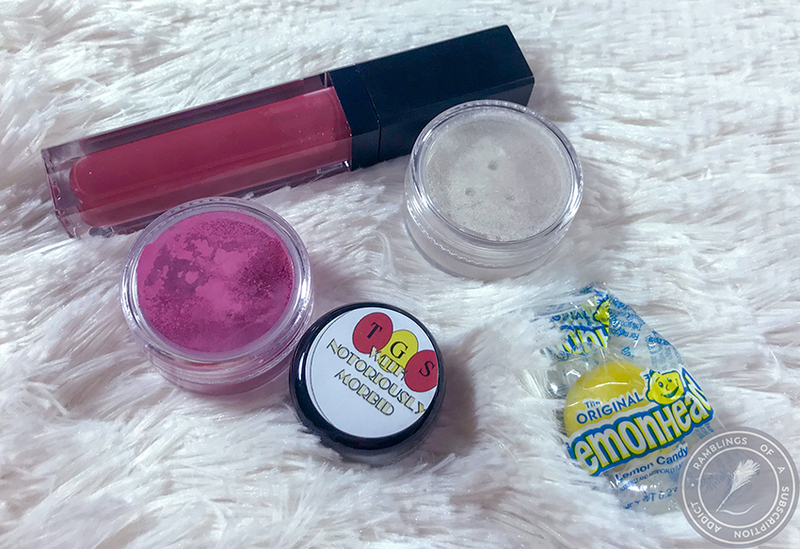 Products can include eyeshadow, blush, lipstick, and/or solid perfume. There is currently a wait list so sign up here to get on the list to start your subscription! How Much is Notoriously Morbid? 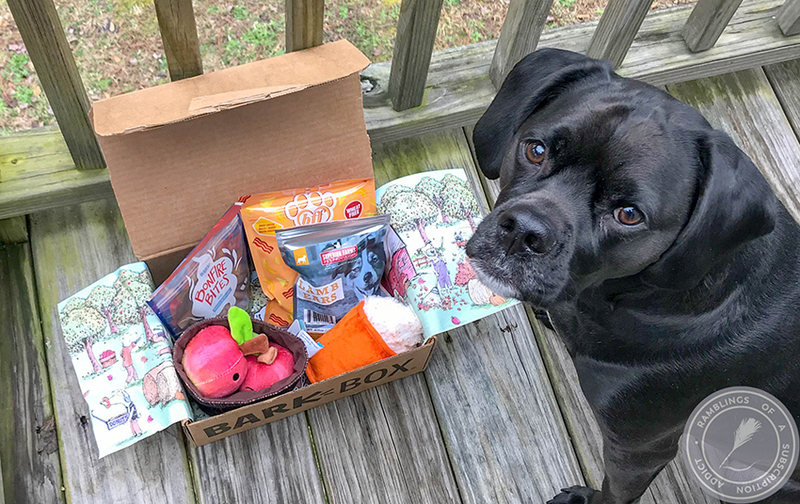 : $15.00/month including shipping to the US. International subscriptions are now $2/month. Use code 'KMRAMBLINGS15' for 15% off your next Notoriously Morbid order (subs not included)! Wowza, that's a pink blush. 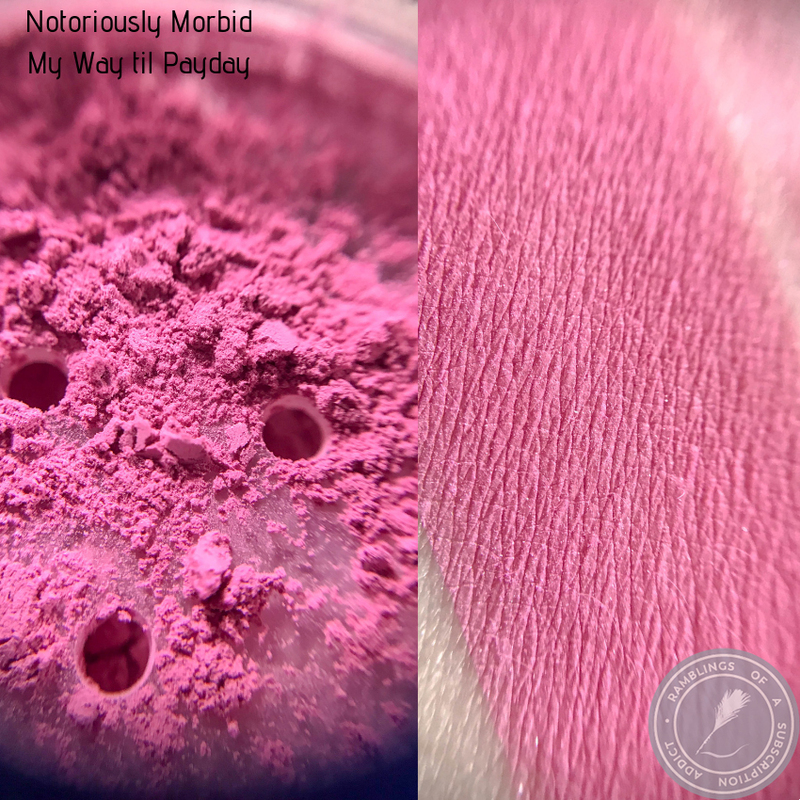 My Way til Payday (Blush) is a rosy pink blush. This is a super bright blush, like, too bright for me. I like the color but it's not quite for me. I don't do super pink shades. 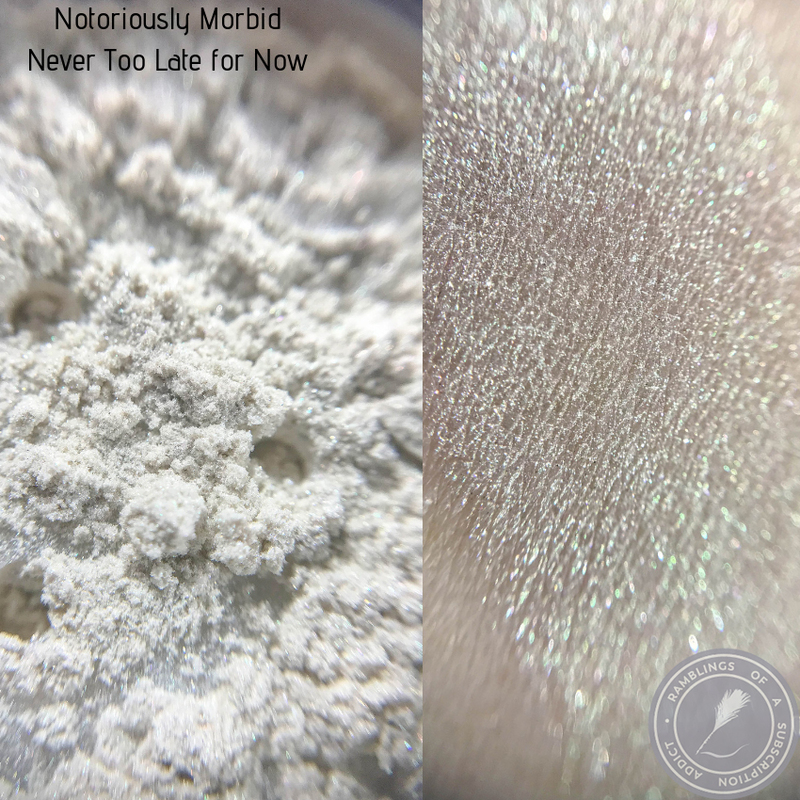 Never Too Late for Now (Highlighter) is a champagne highlighter with shimmery green shift. I'm in love with this highlighter. It's a little green for most looks but with just the right look it's perfect on the eye and cheek. 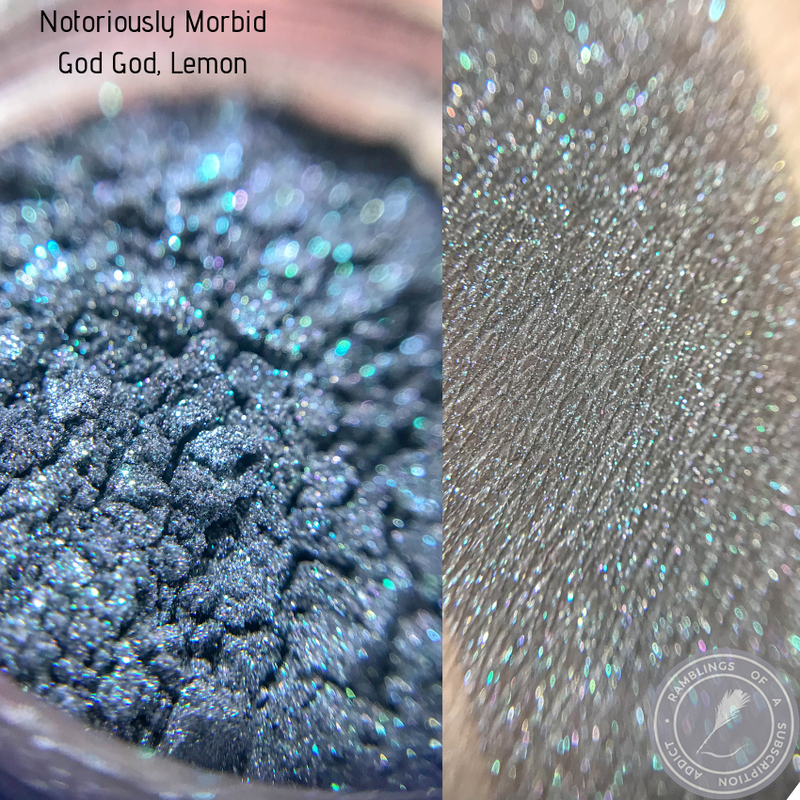 God God, Lemon (Eye Shadow) is a shimmery pewter shadow with blue/green sparkles. 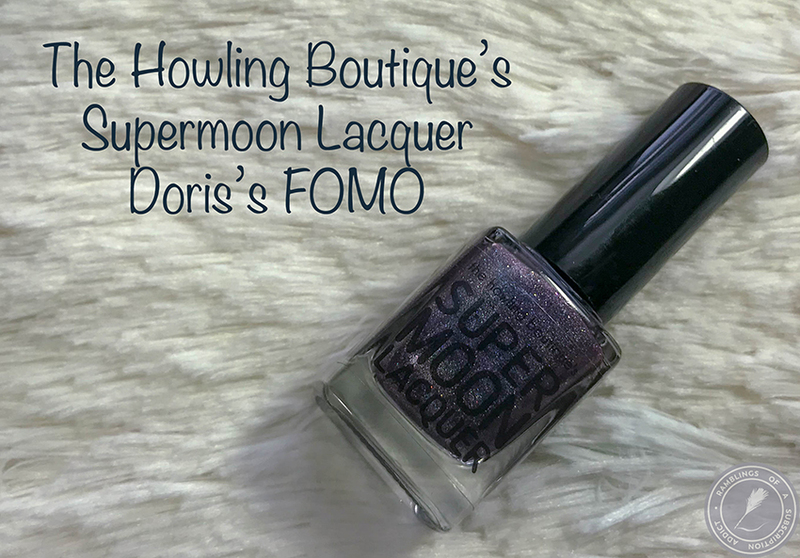 A great one and done for a dark smokey eye look or perfect for your outer V.
This is really pretty for the outer V like the description suggests. 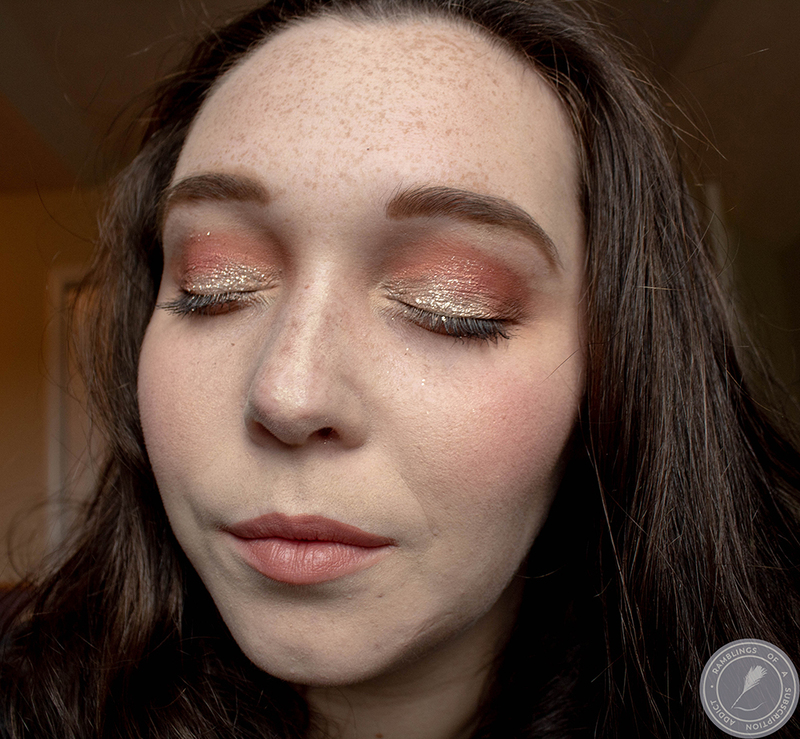 It goes well with a cool-toned brown in the crease and something simple on the lid. I like it! 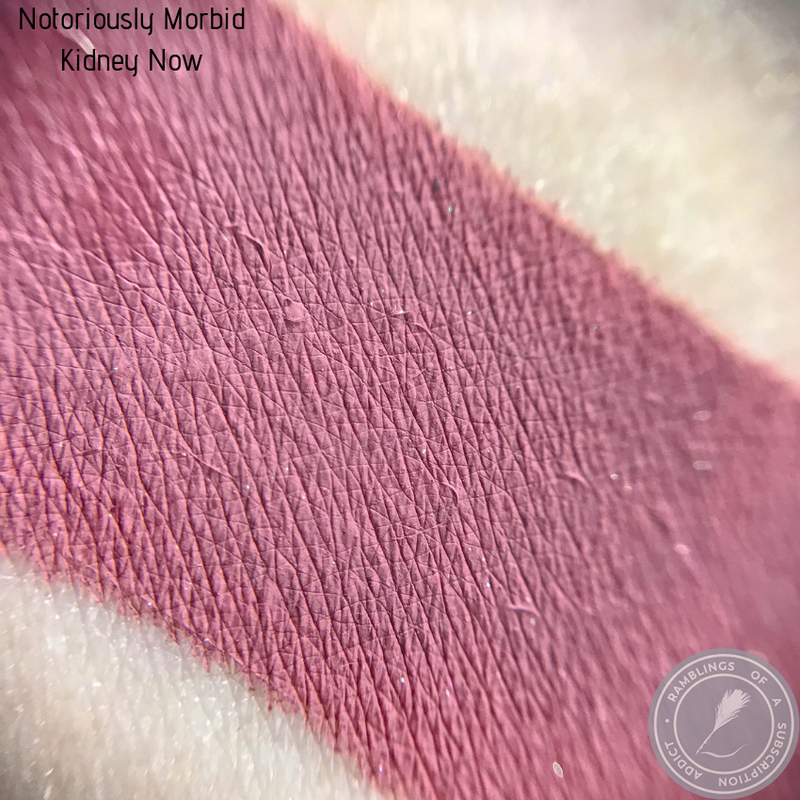 Kidney Now (Mystic Matte) is a light-medium red-brown. 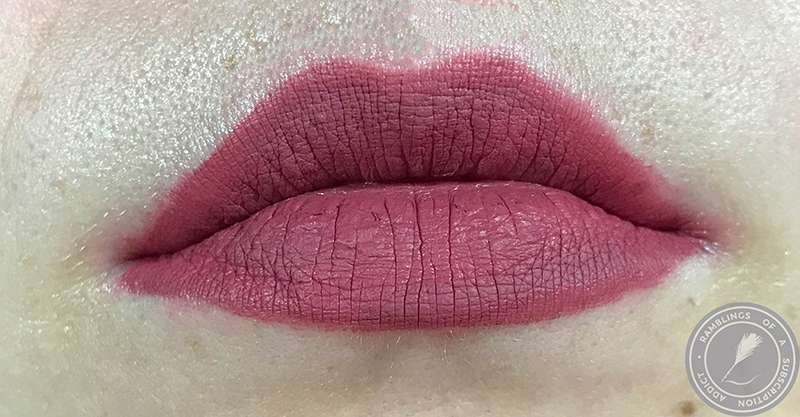 This is my new favorite lip color. 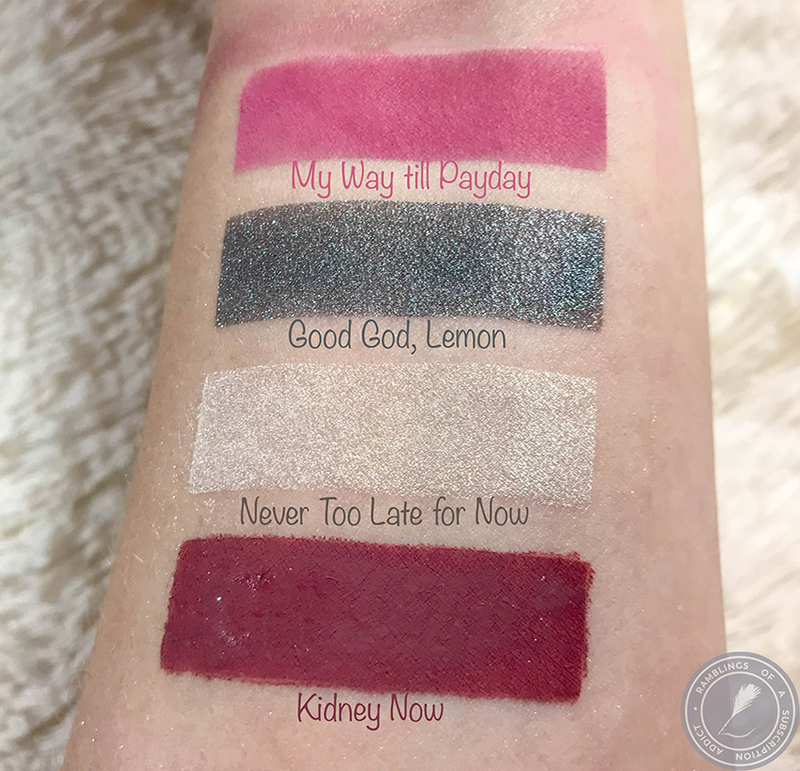 It's just the right shade for me and I can wear it with a ton of different looks. Overall, I loved this month's bag. Other than the blush not being my style, the items were perfect. This bag was only missing one product to make a complete face look, which I love!